Welcome to the “Behind the Shadows” series of blog posts, where every week we will share a peek inside the minds of our authors and learn about the inspirations behind their contributions. This week, Lucy A. Snyder talks about her approach to her story, “The Abomination of Fensmere” and where we might see her protagonist in the future. When I was writing “The Abomination of Fensmere”, I wanted to meld a Lovecraftian setting and atmosphere with a more modern Southern gothic tale. I also thought it would be an interesting challenge to drop a young, Nancy Drew-reading protagonist into a world of cults, madness, and cosmic horrors. My protagonist Penny took hold of my imagination and I wrote a direct sequel for Caelano Press’ The Court of the Yellow King entitled “The Girl With the Star-Stained Soul”. As you might guess, that story ties in with Robert Chambers’ King in Yellow mythos. Using those two stories as a jumping-off point, I’m partway through a young adult novel featuring Penny and all the horrors she has to survive in a fateful summer down in Fensmere, Mississippi. Lucy A. Snyder is the Bram Stoker Award-winning author of the novels Spellbent, Shotgun Sorceress, Switchblade Goddess, and the collections Orchid Carousals, Sparks and Shadows, Chimeric Machines, and Installing Linux on a Dead Badger. She’s had two new books out in 2014: Shooting Yourself in the Head For Fun and Profit: A Writer’s Survival Guide from Post Mortem Press, and her story collection Soft Apocalypses from Raw Dog Screaming Press. Her writing has been translated into French, Russian, and Japanese editions and has appeared in publications such as Apex Magazine, Nightmare Magazine, Jamais Vu, Pseudopod, Strange Horizons, Weird Tales, Dark Faith, Chiaroscuro, GUD, and Best Horror of the Year, Vol. 5.She lives in Columbus, Ohio with her husband and occasional co-author Gary A. Braunbeck and is a mentor in Seton Hill University’s MFA program in Writing Popular Fiction. You can learn more about her at www.lucysnyder.com. 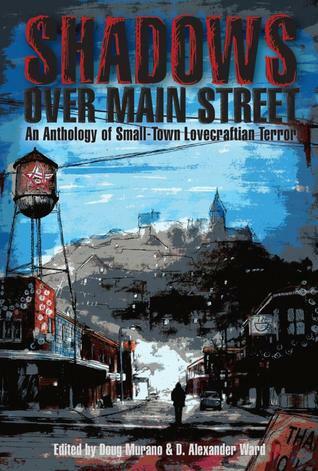 As proof that you sometimes can something for nothing, Hazardous Press is offering a Goodreads giveaway of Shadows Over Main Street! We have 5 books up for grabs for 5 lucky winners and the giveaway ends on February 14th. It could be a nice Valentine’s Day gift. Because we all know nothing says I love you like 280 pages of mind-bending cosmic horror poetry, fiction and art. Enter to win below and then maybe on Valentine’s Day, you will be able to wrap your tentacles around your sweetheart and show them just how much they mean to you. Giveaway ends February 14, 2015.